Reviving the fun once had with classic Polaroid film cameras, the white Snap Instant Digital Camera offers the convenience of digital capture with the thrills of being able to instantly produce a physical print thanks to the implementation of ZINK Zero Ink Technology. The 10MP 1/3.2" CMOS sensor pairs nicely with a 3.4mm f/2.8 lens, equivalent to 25.8mm in 35mm terms, in order to provide users with a simple, yet effective imaging setup. The pocketable camera also features a pop-up optical viewfinder for composing images that is used to turn the camera on and off. Box Dimensions (LxWxH) 7.65 x 7.0 x 1.95"
Snap Instant Digital Camera (White) is rated 4.1 out of 5 by 32. Rated 5 out of 5 by Denny, the potter from Put the fun back in photo I got this camera as a fun Christmas gift for my partner. She adores it, she has fancy digital cameras with all the bells and whistles but she loves the fun of this one. The options of having a border and 3 color choices help add to the fun plus the photo booth 4 pics in one option is a gas. She went all crazy buying a nice case for it along with a ton more film. I think it's her favorite gift this year. The camera could come with a bit more instruction in how to set up it's 3 modes and such, but a quick run to the google machine fixes that. Buy one and have a blast, We've missed the fun of having something in our hands right away, and now there are little photos stuck up everywhere. Rated 1 out of 5 by Anonymous from Camera Stopped working after 9 pictures We just opened this camera. Took 9 pictures. We were very careful with it. Tried to take one last picture to use the last slip of photo paper inside. Now it's jammed. We've reloaded the paper. It won't take any new pictures and it won't do anything.. not even take digital pictures. This is a piece of junk and I want my money back. I even tried hooking it up to the computer to get it to transfer the pictures already on there and the computer isn't even recognizing it. I've tried all 3 USB ports. Rated 1 out of 5 by Camerawerks from Gimmick camera This camera is really just about worthless. Sorry but the idea is to sell film paper. Prints look so so. yes you can shoot to a card but there isn't anyway to view images with out downloading to a device. so worthless. It would be nice if you could decide which picture you would like to print but you can't. so again worthless. Basically goes back to the polaroid days of the 70's and 80's. so a bit pointless. and the final worthless part is they package it really cool but no directions on how to use. so you need to go to a website to figure it out. Again worthless. worst $ i have spent. its worth about $ maybe. Rated 4 out of 5 by Sup09 from Great Camera for a wonerful price! I mentioned this camera really a great one but still I ranked it 4star. To the point everything is great about this camera the only thing is the picture size 2X3 inches is a little bit small. If they had design with at least 5x4 inches, would have been awesome! I bought it for my wife and she loves it and not for the color combination is also great for the price they are offering. Rated 4 out of 5 by Anonymous from Fun Camera, But No User Guide I use the Snap purely for fun. I love the instant prints, although they don't look as great as Polaroid claims they will look. My kids love sticking the prints to my refrigerator, and on their school folders. The biggest complaint I have with the Snap, it does not come with a user's guide. So thankfully there is YouTube to assist in figuring out how to use the Snap properly. However, I like the Snap so much that I bought one for my daughter, as well. Rated 3 out of 5 by Bahama Bob from Camera has some faults Used camera for just 10 pics. We did not like the quality, streaking. The view finder is too small. Looking to upgrade to 23 model, seems to offer more for the buck. Good for taking wallet size photos for your wallet. Can I print photos in memory Again. If so, how do I select the one I want to print? According to Polaroid, it is not possible to print images saved from the MicroSD card. The MicroSD card is only used to save a copy of the image captured. The only way to print to the Snap is whenever a picture is first captured using the Red Shutter Button. Where do you by the photo paper for the Polaroid ? You can purchase Zink paper through B&amp;H.
Can this be used on a tripod? Does this camera come with film? No. it needs to be purchased separately. 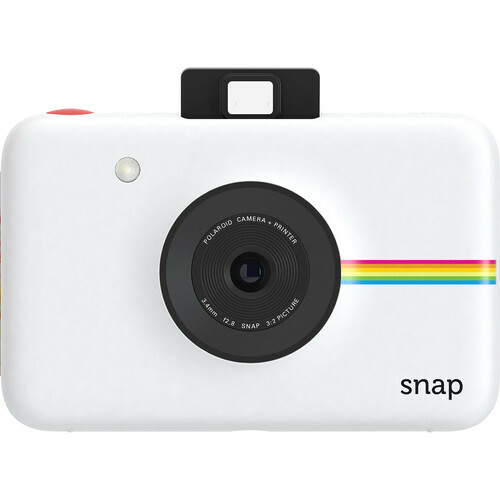 Can i use this camera to print photos from my iphone with the polaroid app and a cable? If not, what is the cable port on the camera for? The cable port on the Polaroid camera is to charge its internal battery. How many shots and prints can I get off a single charge of the battery? Can you take digital only photos without film? Does the camera save just a jpg or raw as well? It only saves JPEG. It does not have RAW capability.